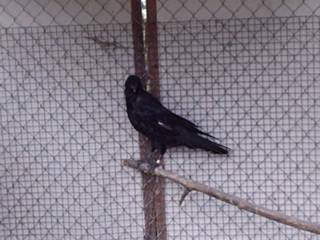 An update on our raven that came to us from Prudhoe Bay. It's healthy and active. It's eating, but not gaining weight. It does have a left wing injury which it won't stop plucking at. The injury is recoverable and it could be released once it's feathers grow back and it gains weight. As you can tell it's in a outside mew. It had some company of other ravens, but they all have been released. Older PostWhat's in your wallet?